There may not be many mango cocktails in the world, but when this fruit comes into our drinks, it's wonderful. Whether you have a mango rum, vodka, or liqueur in your bar or want to play with the fresh fruit or mango nectar, we have a few tasty cocktail recipes you won't want to miss. A few vodka brands offer a mango option in their portfolio and these are very fun to play with. The mango spice cocktail features the fruity vodka of Absolut, but there's a surprise inside this unassuming drink. If hot peppers are too much for you, this cocktail is considerably tamer but no less interesting. It uses fresh sage and cucumber in a classic sour formula with mango vodka and peach bitters. It's utterly charming. One of the easiest ways to get the taste of mango into your cocktails is with mango nectar. This semi-sweet liquid is readily available at grocers, just look in the juice aisle. After a cocktail like the French sparkle, you'll discover why it's a great drink mixer. This recipe is delightfully simple, pairing a raspberry vodka with the nectar and Champagne. If you're looking for something a little different than the famous Bellini, it's a fantastic choice. We're going to put a mango spin on one of our favorite happy hour cocktails. The vodka tonic is a great drink, but when you're in the mood for something a little more interesting, simply add mango. The mango tonic can be made with either mango nectar or mango liqueur. For the latter, opt for a bottle from Bols or Marie Brizard Mango. Pair that with your preferred vodka and tonic water. It's a nice balance of sweet fruit against dry sparkle, making it great for a meal. Mango is a favorite flavor for rum distillers because the tropical fruit is a natural companion for the tropical liquor. Cruzan is one of the brands that you can rely on for this flavor and it's a great addition to any well-stocked bar. The mango iced tea recipe is simple and fun. We're not relying on the rum alone, though, because it's paired with a nice Canadian whiskey. Add chilled iced tea and a refreshing cocktail is ready for your summer afternoon. A berry-filled cocktail, the garden patch smash offers you the choice between tequila and mango rum. The second option is quite delightful, softly contrasting all the fresh summer fruits. This tall, refreshing drink requires you to make a raspberry-lavender syrup, which is incredibly easy. You'll mix that with fresh blueberries, a hint of lime, and your favorite mango rum. To finish it off, a bottle of lavender soda does the trick. Mango makes a great margarita and it comes with options. The easiest is to simply shake your favorite tequila with mango liqueur. Yes, just two ingredients can make an impressive mango margarita cocktail. The second option is frozen and relies on the fresh fruit. It's a nice one to pull out when mangoes appear in the market and, thankfully, that's almost year-round. No matter how you take your mango margarita, don't keep it to yourself. These deserve to be shared. Sangria, anyone? While many sangrias are dark and somewhat heavy, the white peach sangria is quite the opposite. Everything we love about the wine punch is included, it simply uses a brighter fruit and wine blend. The recipe begins with Pinot Grigio and adds mango rum and peach schnapps. Toss in a whole host of freshly squeezed citrus juices, then top it with lemon-lime soda. It's perfect for a spring brunch or summer gathering. A blueberry martini when we're talking about mango? It's true and mango juice is the secret ingredient in this intriguing vodka cocktail. The recipe calls for vodka and orange liqueur along with blueberry and mango juices. The contrast between the two fruits is surprisingly pleasant and you'll find that the mango does ​wonders for freshening up the dark berry. No mango juice? Go with the nectar instead. A rather interesting bourbon cocktail, the global warmer includes an array of flavors. It may not be for everyone, but it's surely going to be a taste adventure. For this recipe, you'll pair fresh mint with the very fine whiskey from Basil Hayden's. 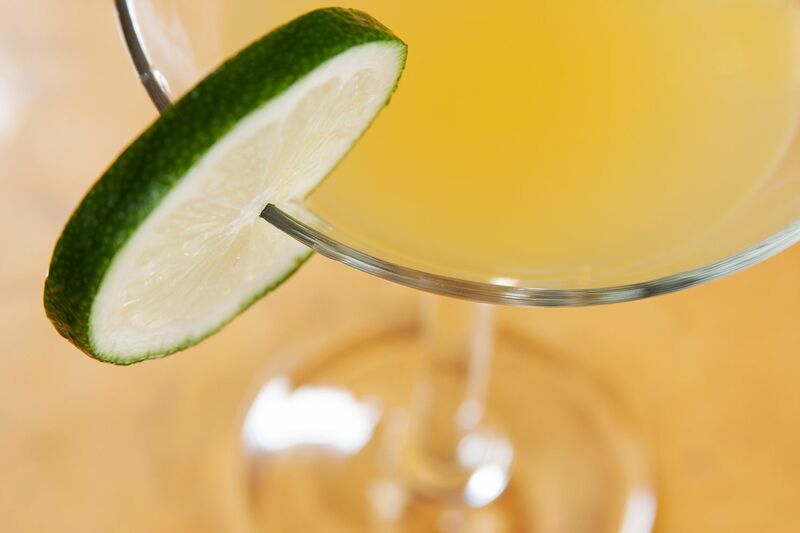 Pour a tropical mango liqueur and triple sec along with a fresh lime sour mix. Shake it all up and brace for an explosion of flavor.